It’s SPRING! No foolin’! One-fourth of 2016 has already passed, and with it we bid farewell to cold and dark Winter and welcome warm and verdant Spring. As we experience the inexorable passage of the “days of our lives,” we also note our own changing seasons, that is, “periods of time marked by particular conditions.” One day, either when the Lord Jesus gathers us to himself or when we fall asleep in death, the legacy of your earthly life and mine will be completed. What will it be? The word “legacy” originally meant, “the office, function, or commission of a legate,” and a legate was a representative or an emissary of an emperor or a general—one commissioned to carry out his will. Today, we think of one’s legacy as the characteristics and qualities he exemplified that we would emulate in order to honor him. For example, Jesus Christ left us a legacy of love and truth. If you haven’t seen the movie, Risen, I do recommend it. The most memorable line for me was when the Roman tribune Clavius, who had come face-to-face with the risen Christ and then believed, was with the eleven disciples as they tried to evade the Roman soldiers looking for Jesus’ body. One of them said, “We do not fear death,” to which Clavius astutely replied, “Then fear the death of what has been entrusted to you.” Actually, Paul told Timothy (and us) the same thing. Timothy, guard what has been entrusted to your care. Turn away from godless chatter and the opposing ideas of what is falsely called knowledge. 8 Therefore do not be ashamed of the testimony about our Lord, nor of me his prisoner, but share in suffering for the gospel by the power of God, 9 who saved us and called us to a holy calling, not because of our works but because of his own purpose and grace, which he gave us in Christ Jesus before the ages began, 10 and which now has been manifested through the appearing of our Savior Christ Jesus, who abolished death and brought life and immortality to light through the gospel, 11 for which I was appointed a preacher and apostle and teacher, 12 which is why I suffer as I do. But I am not ashamed, for I know whom I have believed, and I am convinced that he is able to guard until that Day what has been entrusted to me. 13Follow the pattern of the sound words that you have heard from me, in the faith and love that are in Christ Jesus. 14 By holy spirit that dwells within us, guard the good deposit entrusted to you. 1 You then, my child, be strengthened by the grace that is in Christ Jesus, 2 and what you have heard from me in the presence of many witnesses entrust to faithful men who will be able to teach others also. 3 Share in suffering as a good soldier of Christ Jesus. That the good deposit entrusted to you and me is the magnificent truth of God’s Word (particularly “the Secret”) is clarified in the following verses, which are set in the context of the inside-out transformation that is available via the power of holy spirit energized by an intimate relationship with our Lord Jesus. 1 Therefore, having this ministry by the mercy of God, we do not lose heart. 2 But we have renounced disgraceful, underhanded ways. We refuse to practice cunning or to tamper with God’s Word, but by the open statement of the truth we commend ourselves to everyone’s conscience in the sight of God. 3 And even if our gospel is veiled, it is veiled to those who are perishing. 4 In their case the god of this age has blinded the minds of the unbelievers, to keep them from seeing the light of the gospel of the glory of Christ, who is the image of God. 5 For what we proclaim is not ourselves, but Jesus Christ as Lord, with ourselves as your servants for Jesus’ sake. 6 For God, who said, “Let light shine out of darkness,” has shone in our hearts to give the light of the knowledge of the glory of God in the face of Jesus Christ. 7 But we have this treasure in jars of clay, to show that the surpassing power belongs to God and not to us. Did you notice in verses 4 and 6 that it is JESUS CHRIST who personifies the invisible God? Many misconceptions about God could quickly be dispatched simply by considering the words and deeds of His Son, which are nothing like those false notions. Being invisible, God realized early on that He had a major image problem. He needed a brilliant “P.R. Man,” and He found one in Jesus. As His Father’s “publicist,” Jesus flawlessly displayed God’s heart of love and spoke God’s truth. How? By perfectly internalizing The Written Word and becoming The Living Word. God loves me, this I know, for the Bible tells me Jesus loves me so. 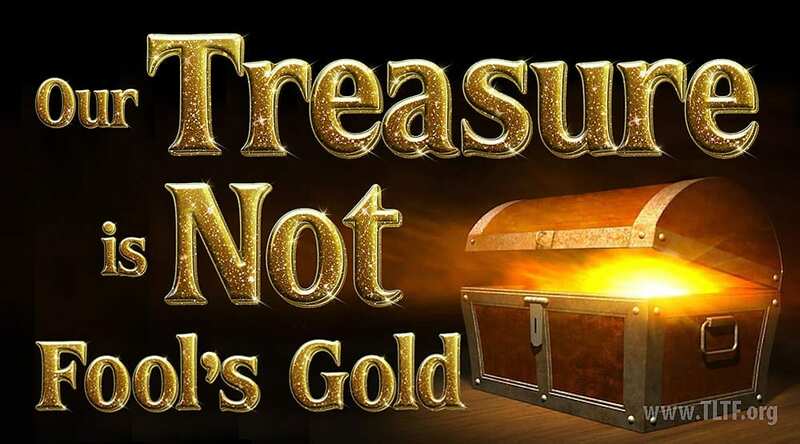 Think about the treasure (“something greatly valued and highly prized”) that God has given you and me. Because of what you have been taught, you can open your Bible and understand who God is, who Jesus is, their relationship with one another and with you, which scriptures are addressed to Israel and which are to Christians, what salvation is and why it is permanent, that God is love and neither causes nor allows evil, that God does not have absolute foreknowledge, what the manifestations of the spirit are and how to use them, how to be healed inside and out, how you can love people, the purpose of your life, what happens IF you die, why you might not, what your true hope is, and what your everlasting destiny will be. How many other folks do you know who understand and who can articulate those priceless truths? We in The Living Truth Fellowship are doing all we know how to do to preserve the legacy of God’s Word for our children and grandchildren—and yours. We encourage you to be a part of this noble effort. How? Take advantage of our resources and learn the Word, share them with others, pray for us, support us financially, speak into our lives with any suggestions you have, and BE THE LIGHT of the World you are called to be. In closing, it was two years ago this month when I first made known in FRUIT OF D’VINE my medical diagnosis of Stage 4 Non-Hodgkins Lymphoma in my bone marrow, and asked you to pray for me. If you have, THANK YOU!!! As per 2 Corinthians 1:11, your prayer has made a difference. I trust you have noted the updates I’ve shared in our communiqués to you since then, and rejoiced with me at how the Lord is working to make me whole. I will tell you that my blood composition is now sufficient for me to have the hip replaced that has pained me for three years, and that is scheduled for May 2. I know that many brethren who read this letter also need healing, and I offer the following few thoughts in that regard. In His Word, God gives us a raft of wonderful promises, such as healing our sicknesses (Ps. 103:1ff, et al). But what do we do with our minds and hearts when we beseech Him for something, like healing, and it does not immediately come to pass? First, we never abandon what we understand from the Word in the face of experiences and circumstances we do not understand. Next, we keep asking and expecting, not desperately but confidently and thankfully. Then we take whatever “next step” the Lord puts before us that will lead to resolving our situation. What do we know from God’s Word? First, the will of our heavenly Father is to completely heal us. In fact, he and the Lord Jesus want it more than we do. Second, God and Christ are more than able to heal us. Therefore, we know we can pray for that with confidence.